Our aim is for our children to read confidently, fluently and with good understanding. We want our children to develop the habit of reading widely and often, for both pleasure and information. To do this, we provide our children with a range of different reading books, covering stories, poetry, play scripts, instruction and information. The main reading schemes we use are Phonics Bug and Bug Club. KS2 children also have a login for on-line eBooks, these can be accessed via the link below. Please ask your child’s class teacher for their login details. Children take home a variety of reading books as we value the input of parents listening to their children read at home and feeding back comments through the home-school reading record book. We have daily phonics lessons where children are grouped according to the phase that they are working at. To teach phonics we use the letters and sounds programme and the Jolly Phonics scheme. The strong emphasis we place on reading during our children’s time at Easington Lane reflects how fundamentally important we believe reading is to our children’s development. 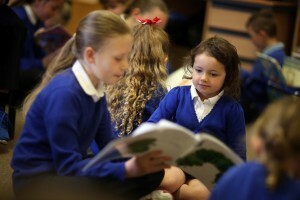 The reading objectives are covered in both reading and writing across a range of genres in every year group. The following link details objectives covered in each year group. Click Here for an overview of the teaching of Reading.